High Caliber Shilohs and Brick Chapel Shilohs are very happy to announce the upcoming puppies from the beautiful and sweet momma Kiana and the handsome, proud papa Kilian. We expect wonderful temperaments, nice broad heads, and good size and substance from these two champion Shilohs. Kilian is a handsome plush brown sable with a thick coat, nice small ears, and a proud bearing. He has a beautiful head, nice bone, width of chest, and beautifully balanced structure. His calm and dignified demeanor further serves to make him a very impressive Shiloh with much to offer our breed. 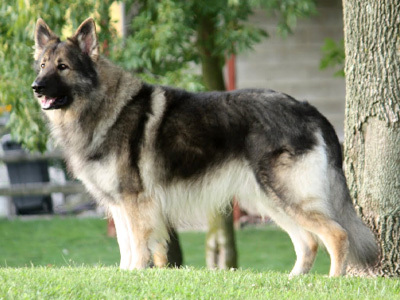 His conformation titles, National Select awards, Adult Temperament Test and Canine Good Citizen certificates show that he possesses exceptionally good structure and temperament. Kiana is our sweet and exuberant grey sable girl with a velvety soft plush coat. She delights in outrunning all our other Shilohs and them strutting around the yard with ball she beat them to. Watching her move is like poetry in motion, yet in the house she is content to lie on the couch and cuddle and loves to rub her whole body against you like a cat. Kiana achieved her conformation title in her first two weekends of showing and also has earned Top Dog and National Select awards and her Adult Temperament Test and Canine Good Citizen certificates. We will have all plush puppies in this litter with both sables and duals expected. Temperaments should be medium to medium soft. These pups will make wonderful companions, good therapy dog prospects, and we should also have some excellent show/breed prospects, as both the sire and the dam have already produced pups who have attained their grand championships before the age of two. If you are interested in one of these puppies, please contact me soon to reserve yours.